​A report from California, written for Carnival Glass Encore in 1984 noted that Indiana Carnival Glass first appeared in local Safeway stores in 1970: “at that time it was really cheap, all the major drugstores had a big line.” In the 1980s it was being sold in Thriftway grocery stores in colourful Indiana boxes. Indiana's first colour was “Iridescent Blue” in 1971, followed by “Iridescent Gold”. They were followed by “Iridescent Sunset” (red to amberina as shown below), “Iridescent Green” and finally in 1974, “Iridescent Amethyst.” Purple and rare black were also used by Indiana, and the Heirloom series includes items in these colours. 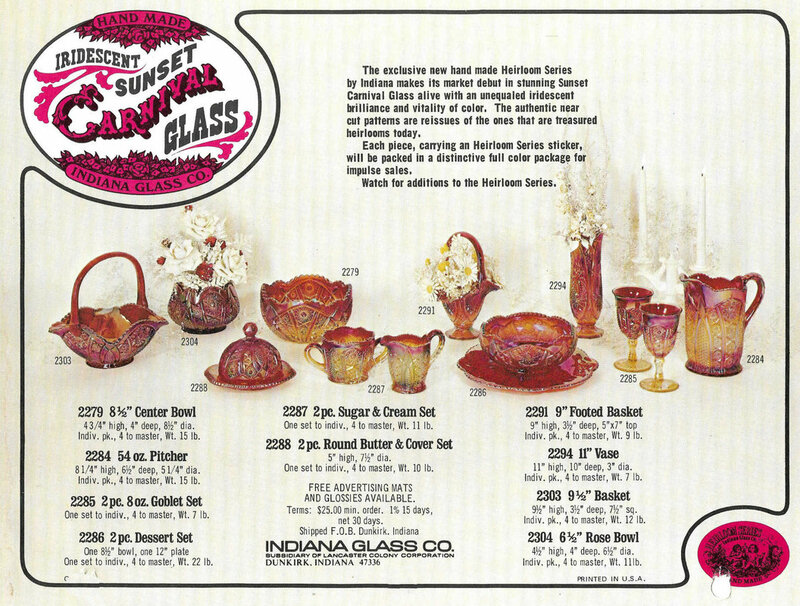 Indiana Glass catalogue pages from the 1970s, showing their range of "Sunset Iridescent" (red / amberina) Contemporary Carnival in their Heirloom pattern. Heirloom - Contemporary Carnival Glass made by Indiana Glass Co.
​Heirloom is a near-cut geometric pattern that can confuse collectors into thinking it is Classic Carnival Glass - however the Heirloom pattern was not made in Classic Carnival Glass. Heirloom is an old Indiana Glass near-cut geometric pattern, originally from the 1900s when it was made in a range of crystal, non-iridised tableware shapes. It was known simply as the “123 Pattern”. On the right is an extract from Indiana's 1910 catalogue showing several shapes in their "123 Pattern". It has also been named Panelled Daisies and Finecut by Pattern Glass collectors, and it is sometimes also called Octagon Variant by today's collectors. ​Indiana reintroduced the "123 Pattern" in the 1970s for its production in Contemporary Carnival Glass, calling the pattern their Heirloom Series. It became one of their best selling ranges! Indiana's 1910 catalogue offered Heirloom - aka "123 Pattern"
​in various shapes, made in crystal (non-iridised) glass. Indiana's Heirloom table set in Sunset Carnival, courtesy of Seeck Auctions. The colour “Sunset Carnival” was Indiana’s best selling colour in their Heirloom pattern range; it varies from cherry red to amberina and it is very beautiful. Indeed many have confused into thinking it is old, Classic Carnival. ​Their amethyst Carnival range was equally easy to confuse with Classic Carnival! Click on the link below to see a full page catalogue picture of Heirloom pieces in Iridescent Amethyst Carnival. Indiana Heirloom pattern in Iridescent Amethyst Carnival - it is absolutely stunning!